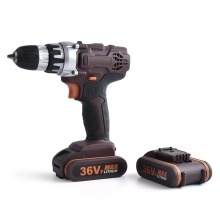 Double Speed: the electric drill has double speed to adjust from according to your different demand. Operation: one button switch is very easy to control, the electric drill can be forward and reverse rotation, and it has a safe locking. Lighting: with LED flashlight for lighting up the working area. Battery: equipped with 2pcs 36V, 1300mAh li-ion battery, they are rechargeable and long duration. Convenience: 2pcs alternative rechargeable lithium battery, quite suitable for the long time of outdoor working. Apply for drilling and screw removing, very helpful for home, factory to use.